Cartoon Network’s first miniseries Over the Garden Wall charmed audiences during its network run in November 2014, and this fall, fans can go even deeper into the Unknown with a line of consumer products celebrating the series. Building on the mystical tale from creator Patrick McHale (Adventure Time) are a DVD release with all ten episodes plus bonus materials, a limited-edition “For Sara” Cassette from Mondo with more than 20 minutes of originally-produced content, and a four-issue comic book series written by McHale and released by KaBOOM! 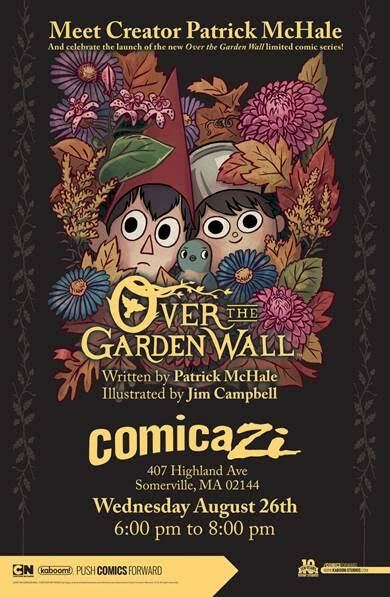 The critically acclaimed and Emmy® Award-nominated, Over the Garden Wall is the story of two brothers, Wirt (voiced by Elijah Wood) and Greg (voiced by Collin Dean), who find themselves lost in the Unknown; a strange forest adrift in time. With the help of a wise old Woodsman (voiced by Christopher Lloyd) and a foul-tempered bluebird named Beatrice (voiced by Melanie Lynskey), Wirt and Greg must travel across this strange land, in hope of finding their way home.